In January 2016, our alert, “Navigating the New and Growing Market of Charter School Construction Financing,” examined the charter school real estate market with a specific focus on charter school construction financing. This alert presents an update on the charter school market and shows that the demand for charter schools remains strong. According to the 2016 Annual Report issued in May of this year by the National Alliance for Public Charter Schools (NAPCS), during the 2016-17 school year, approximately 3.1 million students across the country attended charter schools, or about 5% of the nation’s overall K-12 public school enrollment. That’s nearly 15% growth from the prior year. 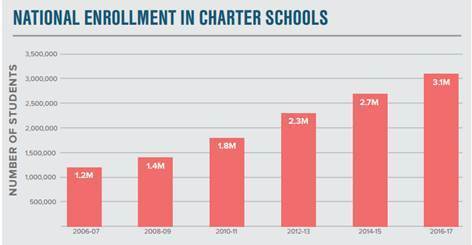 Since 2006-07, the national charter school enrollment has grown by an average of roughly 20% per year. On a state level, states with the largest charter school enrollments during the 2016-17 school year include California (604,700), Florida (291,200), Michigan (146,100), New York (132,200), Pennsylvania (138,400), and Texas (315,200), as set forth in the Estimated Charter Public School Enrollment, 2016-17, published by the NAPCS. That Estimate also indicates that Mississippi (65%), Arkansas (20%), Maine (32%), Virginia (33%), and New Jersey (19%) saw the greatest year-over-year enrollment growth in 2016-17. Notably, according to the Estimate, no states’ charter school enrollment decreased during that period. Colorado’s charter school enrollment and growth were 114,700 and 5%, respectively. According to the NAPCS 2016 Annual Report, during the 2016-17 school year, approximately 3.1 million students across the country attended charter schools, or about 5% of the nation’s overall K-12 public school enrollment. The Annual Report states that those 3.1 million students attended one of the 6,939 charter schools across 44 states and Washington D.C. (Only Nebraska, South Dakota, North Dakota, Montana, West Virginia, Vermont do not have laws permitting charter schools, as depicted in the Annual Report.) According to the Estimate, in Mississippi, the number of charter schools grew by 50%, the highest in the nation, with Maine second at 29%, and Virginia third at 13%. The number of Colorado charter schools increased by 5%. By contrast, the number of charter schools contracted or fell in 9 states, with Washington seeing a 13% contraction, the most significant. In addition to enrollment and opening data, recent survey results published in the Annual Report indicate that prevailing attitudes towards charter schools support a bullish view on the charter school sector. 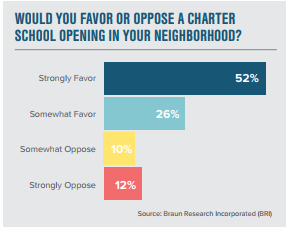 As shown below, a recent survey found that 76% of those surveyed favor a charter school opening in their neighborhood. The findings from a separate survey of 1,000 parents with school-age children, summarized in the Estimate, suggest two additional conclusions about the charter school sector. First, that it could grow even faster if more charter schools were able to open. Second, that there are at least 2 million students nationally whose parents would enroll them in a charter school if they could. In addition to these surveys, recently-enacted state legislation provides some anecdotal evidence about the growing support for charter schools. In May of this year, Colorado passed HB-1375 with bi-partisan support. Heralded as the “first of its kind,” HB-1375 requires Colorado school districts to either develop a plan by the 2019-2020 academic year to equitably share mill levy override funds with charter schools of their districts or to distribute 95% of the per pupil amount of the revenue to those charter schools. And in 2016, Idaho passed a bill giving charter schools greater latitude in writing and negotiating teacher contracts. Based on the enrollment trends, new charter school openings, public attitudes and state legislation discussed above, the charter school sector remains strong, and the demand for charter schools is outstripping the supply of facilities. This presents an opportunity for developers and investors. If the business opportunities that the charter school sector presents interest you, Otten Johnson will be hosting an event on that topic, with a focus on charter school development and construction finance. If you are interested in attending, please email Heather Baker at hbaker@ottenjohnson.com to be added to the invitation list.